If you don’t know her name yet, you soon will, Cole Gibsen, author of Katana (published by Flux Books) and Breathless (published by Crescent Moon Press) is represented by Chris Richman of Upstart Crow Literary and she is part of the Apocalypsies, a group of debut Y/A writers all of whom will be published in 2012. From Cole’s bio, one learns that she is a chipped-nailed rebel, a drinker from cartons, but it won’t tell you that she is a writer willing to push her characters into impossible choices. Her quick wit and snarky personality are infused in every word. She has that unique mix that all writers strive for – a compelling voice that clearly defines her, and the ability to infuse lighthearted comedy into tense action. Her hair might change with each new novel, but don’t underestimate her, Cole touches on deep subject matters, but will always make you laugh by the end of the page. 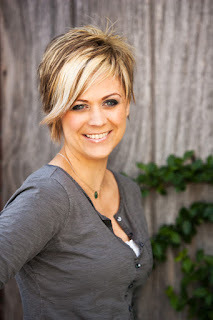 Cole is a great writer for young adults, she gives Rileigh and Edith voices that young people can identify with, one they can recognize, and her books carry messages that Cole knows every young woman needs to hear. She is deeply connected, not only to the teens of today, but the teen within herself. It is that inner strength that allows her to connect with her readers so effectively. You have a great voice that comes through Rileigh - do you have any advice for those writers trying to find their voice? I like to make character bio sheets for my characters before I even write a word of my novel. This can be anything from what my character looks like to their favorite color and favorite food. Even though this information might not show up in your book, I think it’s essential for getting an idea of who your character is and making sure that voice shines through on your page. 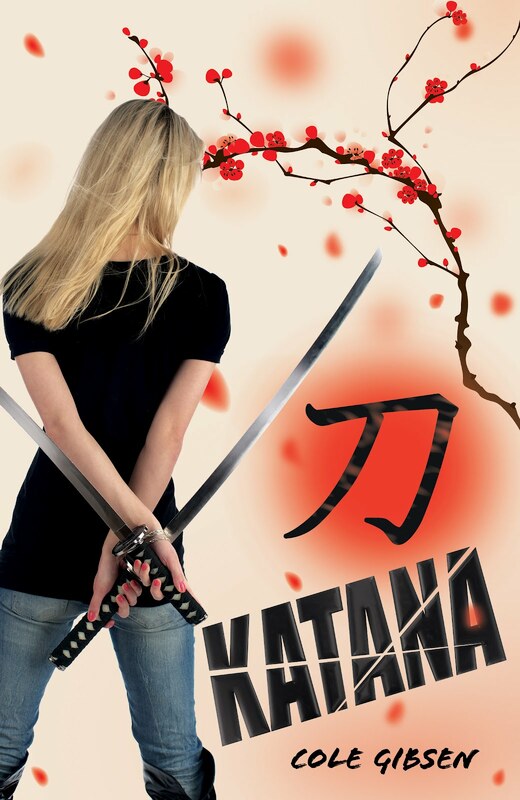 What made you choose to write Katana in the first person? I like first person because I like the flexibility and ease it allows when switching from internal and external thought. My characters have a lot of snarky thoughts. Obviously you love the Japanese, but besides Samurai and Geisha, what else do you love about their culture? Oh gosh, so many things! One of my favorite martial artists was Miyamoto Musashi. I wish I had a time machine so I could go back and watch him train and fight. At least his teachings survived—The Five Rings is one of my all time favorite books. I love Twitter for chatting with, not only readers, but other authors that I admire. I love the casual feel of it—like you and your 2,000 closest friends are chatting it up at a café. If you could meet one of your characters (beside the MC), who would it be and where would you meet? I would love to meet Gimhae Kim (my once-samurai-now-martial-arts-instructor) who I picture looking like Rain from Ninja Assassin. But then again, my husband might not like that too much. Which line do you struggle with more, the first or the last? Definitely the last. Writing the last chapter has always been the hardest part of novel writing for me. I think it’s because the ending can make or break a novel and I want to make sure I get it just right. Katana and Breathless both star 17 year old young women, what made you want to write for teens? I love the raw emotions and drama that take place during the teen years. Er, at least I like writing about them—definitely not experiencing them. Do comic books count as literary? Definitely, especially around here at The Writers' Lens. Because if they do, it’s always been a toss-up for me between Jean Grey as the Phoenix and Felicia Hardy as Black Cat. They’re both powerful, independent, and intelligent women. In the end, I think I’d have to pick Felicia Hardy because she has much better taste in men. Because if you read comics, you know that Spiderman is awesome and Cyclops is a tool. Thought Jean Grey does have that smoldering kiss with Wolverine…I might have to get back to you on this. Do you have a process when you write? Do you write at the same time every day or whenever you can find time? Do you outline or let the words flow? Yeah, this is a tough one for me. I have a little one who goes to preschool only two hours a day. So I only have two hours to get work done. I try to get as much writing as I can in those two hours, but sometimes blog posts, website maintenance, and emails chip into my time. Because of the little time I have, I definitely work better with an outline. It helps me stay focused. Here at The Writers' Lens our motto is Bringing Fiction into Focus, so: What brings your writing into focus, the characters, the stories, or the love of crafting words? Reading. I absolutely adore reading—which is why I got into writing in the first place. Every time I read a good book, it renews my passion to write all over again. Those of us here at The Writers Lens’ couldn’t agree more. There, of course, is so much more to talk about, but Cole needs to keep some things still hidden away in her Kimono. Obituary-reading emo girl Edith Small is broken - the end result of forcing herself inside a mold that doesn't fit. All she wants is to conform to her strict sergeant stepfather's rules long enough to make it to graduation day. But a boat accident threatens to unravel the life Edith has worked so hard to keep. After waking up in a hospital with a lacerated shoulder, Edith fakes amnesia. Because admitting she received her injuries from a blue-haired girl who breathes underwater is all the reason Sir needs to send Edith on the first bus to military school. Safe at home, Edith struggles to put the nightmare behind her. But the mysterious creatures that live in the ocean aren't about to let her forget. After meeting Bastin - a strange boy with silver hair and black eyes - on a secluded dock, Edith learns about the war raging undersea to end human existence. A war that Edith, unwittingly, has become the key to winning. Check back on Monday for an exciting giveaway! Great interview, Brad & Cole! After a month snafu with my preorder, I finally got my copy of Katana in the mail today! This interview makes me even more excited to get reading it. Wonderful interview! Go get 'em, Cole! Enjoyed reading about Cole's writing, especially the use of character bios. I predict she will be a young adult author to watch.